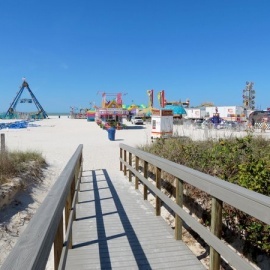 Located between St Pete Beach and Madeira Beach, Treasure Island Florida is certainly a treasure along the Gulf Coast of Florida. Treasure Island restaurants include fresh seafood restaurants, outdoor dining and some of the best sunsets on the beach. You will also find popular nightlife and bars in Treasure Island FL. Many of the bars on the beach have a variety of entertainment including volleyball and live music. Not only will you find some of the best restaurants & beach nightlife, but also you will notice there are many things to do in Treasure Island Florida. Enjoy everything from a walk along the Treasure Island Beach Trail, a boating or fishing charter, watching one of the most beautiful sunsets along the beach or shopping at John's Pass. Being part of the Tampa-St Petersburg-Clearwater metropolitan area, there is plenty of things to do in the area. Now that December has begun, are you wondering what to do thatâll get you into the Christmas spirit this weekend? Well, weâve created a list of fun holiday events in the St.
Party and Stay at These St. Petersburg and Clearwater Hotels for New Year's Eve! Join the 5th Annual "Whatever's Comfortable" Beach Pub Crawl. Get your favorite beach gear on - basically whatever's comfortable - and crawl down St. Pete Beach with Club Sport!